So! Since the other gift I'm making is not a dark wall, I figured I should give Kitten something dark >:D She's the master after all. This wall was made to represent the other side of people. I think everyone has at least a bit of a dark side; a side that you usually keep to yourself. And dark side doesn't necessarily mean bad, nuh-uh. I chose this scan of Rena for it...mostly because I love the scan XD But it also fit with the theme. Those who have watched Higurashi know that there's more than one side to Rena. I haven't vectored in SO LONG. So I'm a bit rusty. I'm so glad I started again though. Without vectoring I just don't feel like myself. I enjoyed vectoring Rena, fun part I guess was the sunburn-like stuff on her shoulders and elbows, and her eyes. I vectored her whole dress but ended up cropping half of it for the wall. Then the wall; I created everything from scratch, basically, besides the overlayed textures. On my last wall with similar lighting (Tsukiakari) I was reminded that the shadow of the window panes would conform to the body's shape, so I tried to work on that here, hope it looks better. I added the roses so it wouldn't be empty, and tried to make the text look like part of the shadow in a way. Vampire version inspired by Kitten-chan's trademark blood ^^ I understand now. The blood was fun XD Blood brushes courtesy of Ann Frost @ Deviantart. your lovely style all over it and I think you did a beautiful job. The shadow of the window fram makes the whole thing seem mysterious. Very nice wall~ i like the texture of the floor~ she looks innocent....but at the same time not..well done! 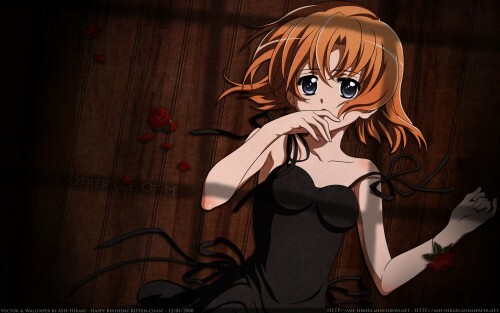 Wow,this is awesome wallpaper.I like so much these shadows of this window its very mazing.These roses on her hand looks more better than in the original scan. This vector is perfect done.I like all version of this wallpaper. I don`t think I really like the texture on her too much. Do you have a textureless version? you're not rusty! I mean, it doesn't look like it! The Vampire Version is <33 You made her eyes really cool on that one! Aw, sorry for the crappy comment >.< I didn't get enough sleep last night, so I'm a bit tired! I miss you! Finally you're back with something wonderful! Great vector of a great girl ;3 I will also comment on AP soon. I love this wall the vector is lovely, the roses are pretty. The background really fits her. Great to produce this picture and atmoshere. Seems so dark and sad..... but awesome work! you really captured her emotions.